Do you ever watch a documentary or news program and find yourself thinking that what they’re saying sounds like complete fiction? Do you ever wish you had your own army of fact checkers to confirm that what you’re hearing is accurate? The folks behind the Signal Media Project sure did! Signal Media Project is a nonprofit organization that promotes and facilitates the accurate portrayal of science, technology and history in popular media. They support the creative process, improve audience understanding, and encourage critical thinking in these important arenas that influence our culture. I was thrilled when they hired me to do their branding, because I’m super passionate about Science, History, and Technology! Also, none of these things can be awesome without factual accuracy. Working with these guys was a blast, and I’m looking forward to working on more projects with them in the future! Hey guys! I haven’t been posting much here lately because I’ve been super super busy making a whole lot of stuff for a whole lot of people. One thing I should mention is that I’m now Creative Director at Zivity. Zivity is a place where Models & Photographers create images with the support and imagination of their Backers. Backers can elect to pay the artists for the content they like, or commission specific kinds of photos. I’ll be doing another post on the rebrand & style guide I did for them, at some point. That said- we just did this awesome Valentine’s Day project that I want to share with you! Our CEO, Cyan, asked me to put together a set of valentines to give out as a thank you to our artists and members. 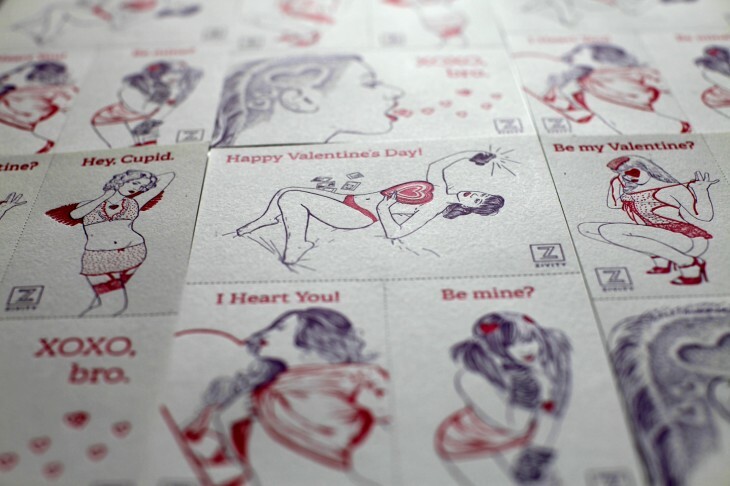 We went through dozens of Valentine’s Day themed photosets on the site to find a handful that would lend themselves well to illustration. I did illustrations based on my favorite shots from those sets, then sent them off to the folks at Dependable Letterpress to print them. I wanted to create something really tactile and weighty for these cards, so letterpress was an obvious choice. We also did a pink to red split fountain effect to get a nice gradient on the second color pass. The cards are perforated so you can tear them off and give them out to all your favorite people. If you want one of your own, sign up to get one here! Miss Kacie Marie by scherbius, Mosh by Redrum Collaboration, Pearl by Sequoia Emanuelle, Gracie Hagen by Anthropix, Porphyria by CandyLust, & Skyee_Line by justice91423. I recently had the privilege of designing all the collateral for spooky chamber music duo, The Parlour Trick. I’ve already shown you the logo I did for them a while back, but there was a whole lot more to the project! Among the things I designed for them were LP packaging, CD packaging, postcards, sheet music, a responsive website, and motion graphics. The photos on the website and packaging are by Ellen Rogers and Audrey Penven. Check out the titles and credits I made for the video below! I also did some post production on the video. Recently, the band released the cd & vinyl pressing of their record. So go get that while it lasts! This has been one of my favorite projects this year, and I’m really happy with what I made for it. Also, this album is awesome. 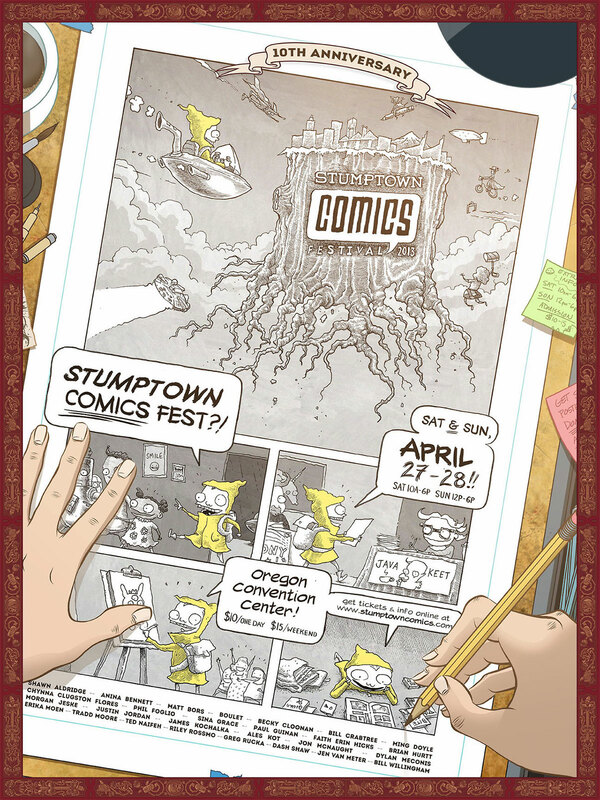 Stumptown Comics Fest is an independent comic convention in Portland that draws over 3,000 attendees yearly. 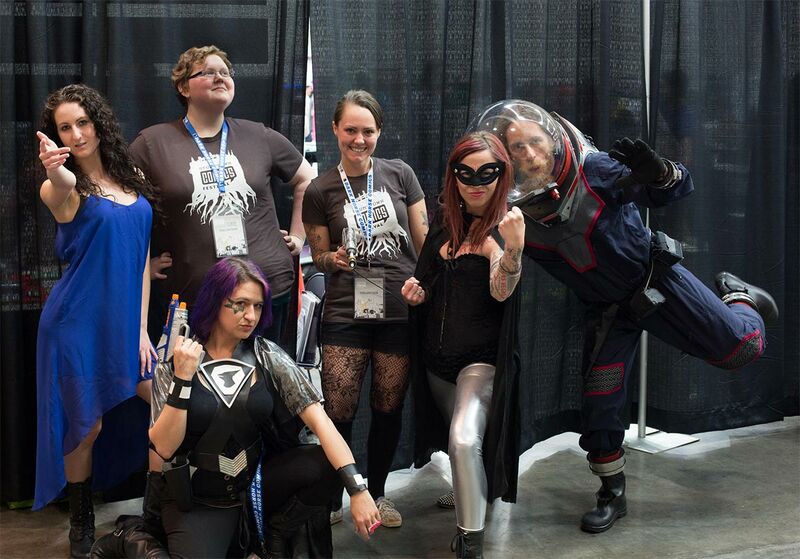 I’ve been going to this show for 7 years straight, and I’ve had the privilege of seeing it grow from a wee thing into a huge and robust convention. To be perfectly honest, it’s my favorite comics show of all, which is why I was so thrilled when I was asked to be the Art Director. My job was to ensure that all visual materials produced for the event by different artists worked together to create a cohesive look for the event. In addition to art direction, I did branding and designed all the print collateral. 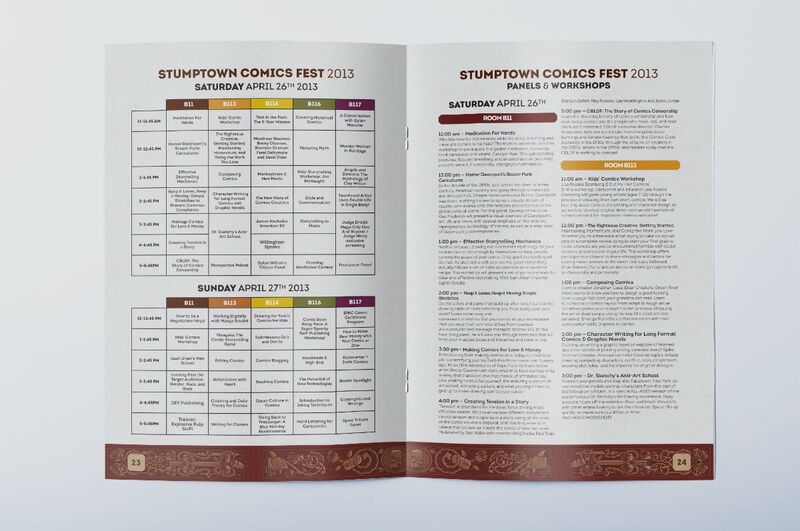 I created a logo and style guide, designed a 34-page program, flyers, badges, t-shirts, and an 18×24″ poster. 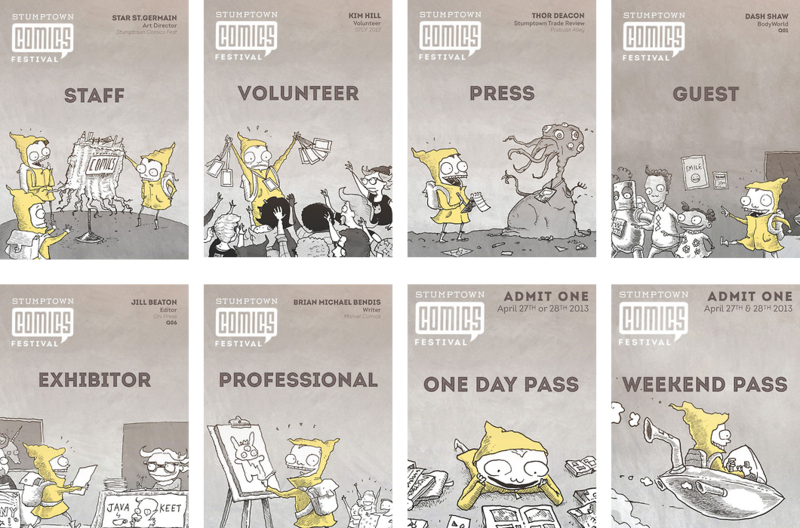 As Art Director, I wanted to create a unified look for all the festival’s collateral. 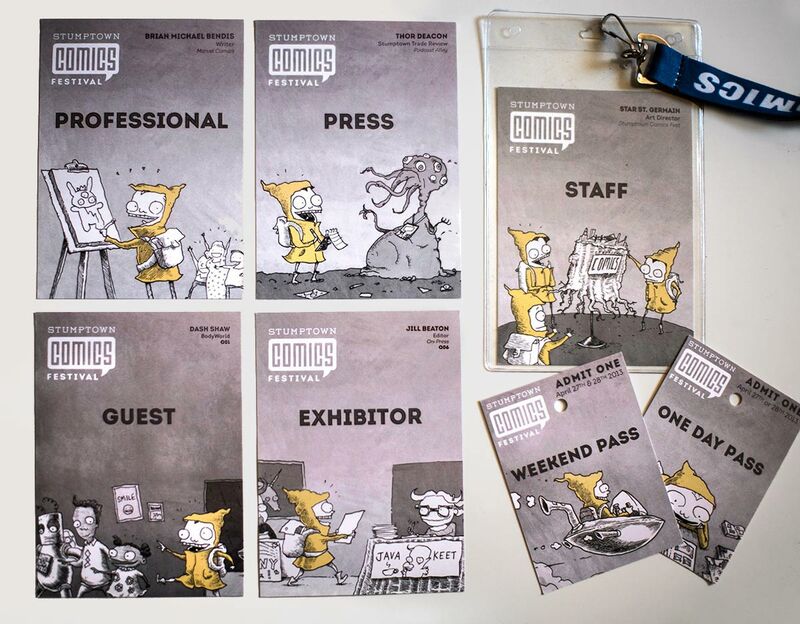 Even though the Festival is now in its 10th year, until I came on board, it had never had a logo or style guide. My goal was to get all the festival-related materials to be tight and visually harmonious. I was invited to art direct the festival by Kaebel Hashitani, the festival director. I’ve known Kaebel for a few years, but I really got to know him well when I put together my show, “Date Lines” at the gallery he co-runs with Merrick Monroe. For the branding, I wanted to create a logo that could be used in different ways. 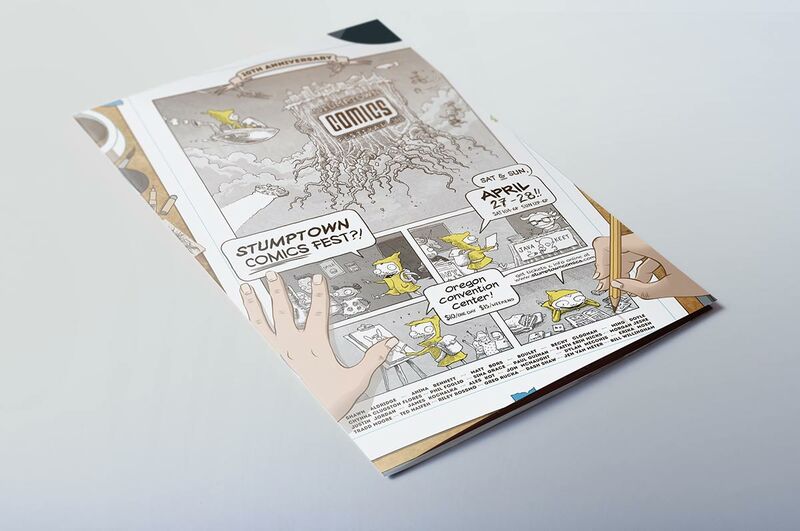 I ended up creating a major brandmark, the tree stump with a stylized Portland skyline. The tree stump can also be removed, and the text inside of that can stand on its own as a secondary brandmark. 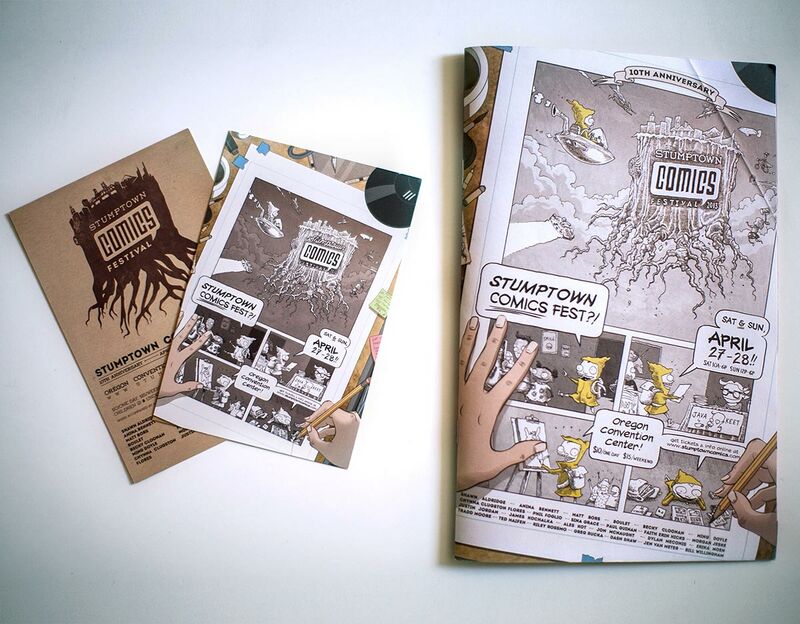 The T-shirt, event booklet and postcard feature the stump logo, while the badges, which are pretty small and feature full-bleed illustrations, look better with the simpler version of the logo. In designing the badges, postcards and other collateral, I got to collaborate with two wonderful artists, Mike Russell, and Bill Mudron. Initially, Bill was supposed to do the poster and Mike was supposed to do the badges, but because they’ve collaborated in the past, I thought it would be good for them each to work on both. The result was spectacular. For the poster, Bill created the artist’s desk, hands and a border. Mike drew the scenes inside the comic panels. In the top panel, Mike riffed on my logo and did an illustrated version of it. I ended up modifying my vector logo slightly to match the geography on top of the stump in Mike’s illustration, because he’s a native Portlander and I’m not. In fact, I was the only remote member of the entire staff, so we ended up doing a lot of collaboration over Skype, phone and email. 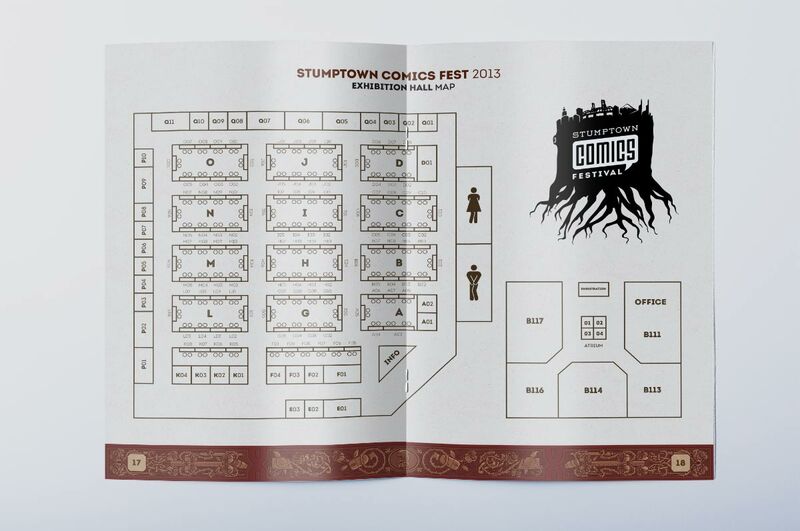 The collateral list was pretty huge: postcards, a poster, program, badges, and the t-shirt. This was the first time that the t-shirts ever sold out completely! The booklet was a big effort as well, because I had to design a color-coded event schedule and a map for the exhibition hall. A huge shout-out to Mary at Brown Printing for getting everything printed beautifully and on time! 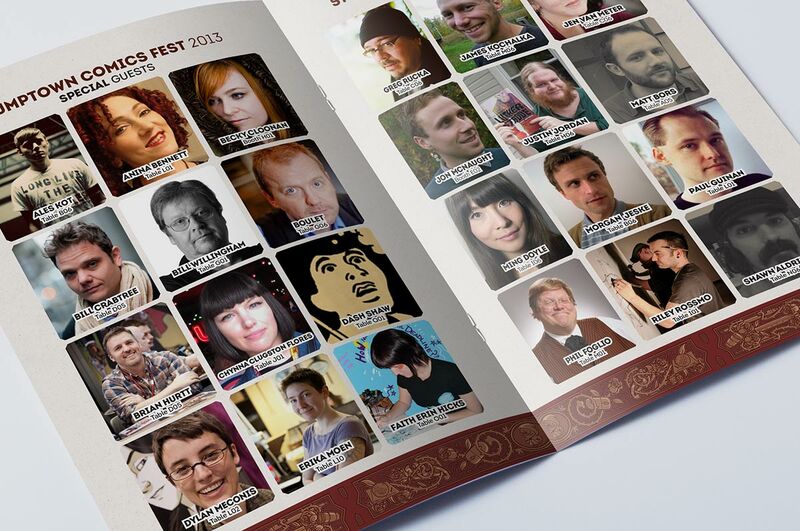 I’ve been asked back to Art Direct for 2014, and I’m really looking forward to pulling it all together again next year!